Patty Pagaling, the director of the Transition to Organics organization, has a dream: to create an Ojai Valley that is “chemical free.” To inspire a community to work together as we begin to reclaim our soil, our food, our air, our place as stewards of this Earth. She is a beacon of light and a visionary who has tirelessly worked to help anyone who will listen find alternatives to the chemical-laden products they might be using in their daily life. Pagaling and her organization are a valuable resource—providing both inspiration and local solutions for local growers. Last year, she inspired me and together we brought the movie Queen of the Sun to the Valley with the hopes that this gorgeous and inspired documentary would speak to people’s hearts. And that it did. Over 200 people came, watched, shared and ultimately began a shift. One farm owner listened and with tremendous courage took the leap to not only eliminate chemical farming but to transition to Biodynamics! For those of you who are unclear about the term “Biodynamics” and where it fits with organics and Permaculture, here is what New Zealand farmer Peter Proctor, says: “Biodynamics makes organics work.” Rudolf Steiner, the creator of Biodynamics, spoke about this system as a way of life—a collaborative, communicative relationship between humans, animals, plants and the soil. He also reminded us that our soil is the soul of our planet. Whether we utilize organic or Permaculture methods in our relationship to our own pieces of land, it is the soil that is the life force of it all. 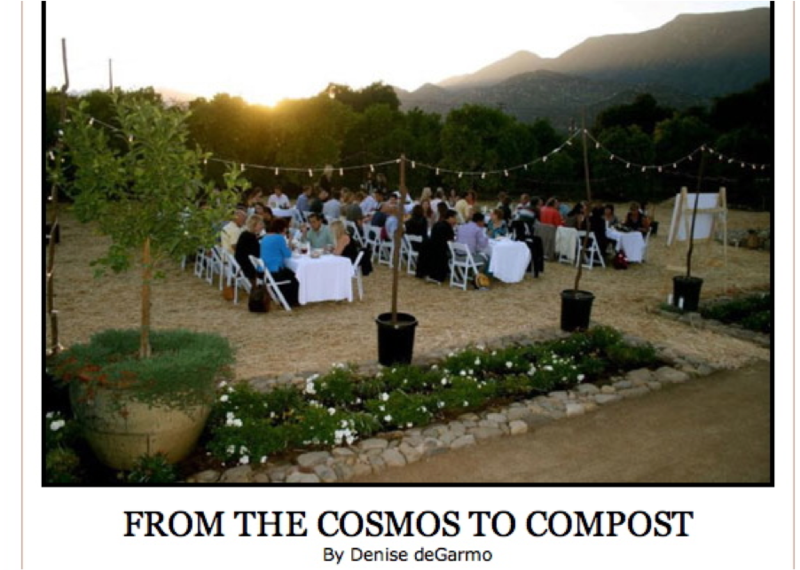 On a recent summer’s night to celebrate the angels in our midst, Transition to Organics had its first fundraiser with a farm-to-table dinner and auction. Under a moonlit sky and with oranges dripping from branches, laughter, music and shooting stars, we celebrated the bounty and the moment. It had been a year since our host, Stony Grove orchard in the East End, took that brave “transition” leap and under a dipping sun and rising moon, close to 100 people made their way through the orchard, the sweet sound of Dani Ma’s voice floating through the leaves as guests stepped through tall corn lilting in the evening breeze, grabbed pisco sours and nibbled on fresh Ojai goat cheese under red and gold sunflowers. As our very own Ojai “pink moment” swept across a fading azure sky, Steve Sprinkel, the evening’s auctioneer, created a friendly bidding war for Biodynamic packages from Sacred Cow Compost, a mini-orchard from Ortiz Nursery, a romantic weekend from Su Nido Inn, an electric bike tour from the MOB Shop and an eco-friendly escape to the Ojai Retreat! Laughter followed cheers to the lucky winners while guests started nudging each other to the silent auction tables. By the end of the evening a seed collection from Mano Farm, organic beer and wine from the Ojai Beverage Company, an oil & vinegar gift box from Ojai Olive Oil, a necklace from Love Heals, pottery by Karen Scott, gift certificates from Wachter Feed, New Leaf Skin Care, Spa and Boutique, Robert Gluckson (Good Cause Marketing), Cynthia Grier (Ecologic Life), Connor Jones (Permaculture consultation), Chris Sobenes (horsemanship lesson), Farmer and the Cook (CSA month membership), a painted heart stone from artist Lyn Wandell and a painting by Ebn Wandell, were safely tucked under arms, into purses and well on their way from the farm and into homes all over the area. And so as the evening came to a close, our stomachs filled through the creative artistry of chef Justin Bear, with food from Rancho Del Pueblo (formerly Gozo Farm), Earthtrine Farm, Tomatomania, Mano Farm, Sulphur Mountain Farm and Valerian Trust, spirits from Casa Barranca and Marian Farms, bread from Knead Baking Co. drenched in Ojai Olive Oil, we were reminded about the power of friendship, the love of community and the magic that happens when you least expect it. With loving hearts and tilted heads to the heavens we all gasped then cheered as a blazing comet shot across the night sky as if to remind us to never stop believing!